Overview - One of the great raconteurs of stage and screen, Spalding Gray, came together with one of cinema’s boldest image-makers, Oscar-winning director Steven Soderbergh, for Gray’s Anatomy, a spellbinding adaptation of Gray’s 1993 monologue of the same name (cowritten with Renée Shafransky). In it, Gray, with typical sardonic relish, chronicles his arduous journey through the diagnosis and treatment of a rare and alarming ocular condition. For the monologist, this experience occasioned a meditation on illness and mortality, medicine and metaphysics; for the filmmaker, it was a chance to experiment with ways of bringing his subject’s words to brilliant, eye-opening life. A man and a microphone. At its core, that's all 'Gray's Anatomy' really is -- and yet, through Spalding Gray's peerless gift for storytelling, and Steven Soderbergh's inventive cinematic eye, a whole world is opened up. Though the camera rarely cuts away from the film's neurotic, rambling star, his effortless words and the director's striking compositions manage to breathe visual life into mere oration. A filmed monologue like no other, the movie presents a fascinating marriage between two gifted artists. While certain aspects of the production don't always reach the heights that they aspire toward, the experiment is worthwhile nonetheless, resulting in a slightly flawed but wonderfully unique experience. Adapted from celebrated actor/writer Spalding Gray's 1993 monologue, the film is essentially a one-man show of sorts. Gray recounts his experiences with a rare eye condition while detailing the elaborate means he went through to treat it. Chronicling his sometimes outrageous experiments with alternative therapies and various, amusing tangents along the way, the monologist espouses hilarious and thought-provoking insights on life and medicine. As the sprawling, verbal stream of consciousness continues, Gray illuminates personal discoveries and universal themes -- all through nothing more than his words. While the idea of an entire movie centered on one man literally recounting a story might not seem especially stimulating, Gray's unique gift for verbal storytelling is truly impressive. A fantastic performer who weaves a charismatic blend of biting wit, neurotic analysis, and ironic observations throughout his work, Gray's words can be truly captivating. His specific mannerisms, inflections, and pauses reveal a masterful command of delivery and timing. The subject matter appears rather straightforward at first, but as Gray continues, and the monologue builds and builds upon itself, the various digressions start to form a greater whole. Tangents about Christian Scientists, Hassidic Jews, and astral projections are juggled smoothly, and from these sometimes chaotic anecdotes, Gray somehow ends up shaping a fascinating, funny, and cohesive tale. Not content to simply document a stage performance of the monologue, Soderbergh instead opts for a much more cinematic and experimental approach. Gray is filmed in numerous, often long takes sitting down in various, simple sets with appropriate backdrops that relate to his story. Carefully timed tracks and dolly movements bolster the momentum and intensity of his words. There's even an instance where Gray himself is physically rolled through different sets as he transitions to new settings in his monologue. Soderbergh's lighting design becomes especially striking, and various bold, moody hues are cast upon the actor, enhancing the tone and emotion of the scenes. As the movie continues, the aesthetic grows more elaborate, and while sets remain fairly simple, they often avoid literal representations of the narrative in favor of more abstract, minimalist associations. Though the visual style can get quite aggressive, it thankfully never overpowers the storytelling, and flashing lights, smoke, silhouetting, music, and subtle sound effects all serve to complement the performance. Mirroring the monologist's own rhythm and timing, Soderbergh seamlessly pieces together each isolated segment of the story with artful precision. As successful as the coupling between orator and filmmaker is, the cinematic approach taken does have some drawbacks -- most notably, the absence of a live audience. Like all performers, Gray feeds off the reactions of his viewers, and that important relationship is sacrificed here. In the film's companion documentary, 'And Everything is Going Fine,' Gray actually remarks that he grows tired of hearing himself speak for so long, and likes to break up his performances by interacting with the audience. Unfortunately, that isn't possible in the film, and as compelling as his story can be, there are indeed instances where Gray's constant ramblings outstay their welcome. In fact, though I did enjoy the movie, there are a few stretches where the actor's neurosis becomes rather grating, tedious and downright annoying. With that said, Soderbergh does actually attempt to break up the monologue in a different fashion. The director intersperses interview footage with ordinary participants about topics related to Gray's story. Regrettably, these bits don't add up to much and really are nothing more than an attempt to pad out the runtime. Likewise, as compelling and complementary as the director's style can be, the balancing act between cinema and monologue never completely results in a fully shaped whole. 'Gray's Anatomy' offers a unique fusion of two different art forms that are tied together by their propensity for storytelling. Spalding Gray's verbal monologue is given visual form thanks to Steven Soderbergh's cinematic ingenuity, and the results are mostly successful. While Gray's words are full of potent emotion, cynical humor, and insightful observations, the one-man conversation can get a little tedious, and though Soderbergh's style is striking, it never quite advances the monologue into a true motion picture. Sort of stuck between two different worlds, the experiment features elements that complement one another brilliantly, but can't quite form a satisfying whole. Flawed but certainly worthwhile, the film remains a testament to Gray's gifts and a distinct entry in Soderbergh's eclectic filmmography. 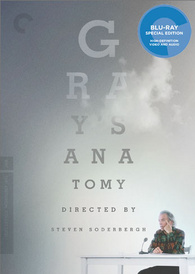 Criterion presents 'Gray's Anatomy' in their standard clear case with spine number 618. The BD-50 region A disc comes packaged with a booklet featuring an essay by critic Amy Taubin. The film's companion piece of sorts, the documentary 'And Everything is Going Fine,' is also currently available from Criterion. The film is provided with a 1080p/AVC MPEG-4 transfer in the 1.85:1 aspect ratio. While the movie is nothing more than Gray reciting a monologue, Soderbergh films the piece in a very unique manner, resulting in some impressive visuals that look fantastic on Blu-ray. The print is in good shape, but there are a few specks here and there. Moderate to heavy grain is visible throughout, adding a wonderful layer of natural texture to the image. Detail is very good, with a sharp level of clarity that reveals every line of weathered character on Gray's face. Colors are the most impressive aspect of the transfer, and Soderbergh's bold and moody lighting design provides a feast for the eyes. Green, red, blue, and purple hues cast over the image in striking setups that pop from the screen. Contrast is nicely balanced, providing a great sense of dimension. Black levels are just a hair elevated but remain consistent throughout. Interview footage shot with high contrast black and white infrared film is also dispersed between the color footage of Gray's monologue. Despite the simple subject matter, the director presents a visually impressive experience. The transfer is free of any major technical issues or unnecessary processing, allowing all of the rich colors and sharp details to come through as intended. The audio is presented in an English DTS-HD MA 5.1 track with optional English subtitles. Though updated from its original theatrical mix, this surround sound track is pretty front loaded, but carries a very pleasing, full, crisp sound. Gray's monologue itself is of course the central focus here, and thankfully his speech comes through with a wonderfully clean, clear resonance. Music and effects are also used to help enhance the mood and atmosphere of the story in subtle but effective ways. Appropriate ambiance (birds chirping, traffic) hits the speakers when called for, and specific music cues do make their way to the surrounds. With that said, the 5.1 aspect of the mix is quite subdued. This limits the track's sense of immersion, but seemingly remains authentic to the theatrical presentation. Dynamic range is fairly wide and distortion free, and while bass isn't much of a factor, the score does offer a few deep frequencies. This 5.1 upgrade is handled with a delicate touch, respecting the original sound design while still opening up the audio in subtle ways. Surround use and directionality are minimal, but the effects work and score do bolster the visuals nicely. The quality of Gray's voice is the real deciding factor here, and his words come through with striking fidelity. Steven Soderbergh (HD, 12 min) - Presented in 1080p with Dolby Digital 2.0 sound and no subtitles, this is an interesting interview with the film's director. Soderbergh discusses meeting Gray and the genesis of the film. The director also details how he went about structuring the movie and the evolution of its stylized visual aesthetic. Renee Shafransky (HD, 18 min) - Presented in 1080p with Dolby Digital 2.0 sound, this is an interview with Gray's co-writer/editor, Renee Shafransky. Shafransky provides details on her working relationship with Gray, and offer lots of fascinating bits about his creative process. Insights into the highly structured nature of Gray's monologues and his blend of truth and fiction are also revealed. Swimming to the Macula (HD, 16 min) - Presented in upscaled 1080i, this is raw footage of Gray's actual macular surgery that is discussed in the monologue. Budding medical students should get a kick out of this. A Personal History of the American Theater (HD, 1 hr & 37 min) - A 1982 performance of Gray's monologue is included in upscaled 1080i with Dolby Digital 1.0 sound. Throughout the monologue Gray discusses various plays he has acted in which then set off numerous tangents. Unfortunately, the videotape footage is not in the best shape, and large portions of the performance are marred by distracting artifacts that cause the picture to break apart. Trailer (HD, 2 min) - The film's trailer is included in 1080p with Dolby Digital 2.0 sound. 'Gray's Anatomy' is a unique blend of two distinct art forms. Gray's storytelling is heartfelt, humorous, and compelling, and Soderbergh's inventive visual style complements the oration nicely. While the end result remains slightly stuck between monologue and film, the experiment is certainly worthwhile. The video transfer and audio mix are both very good, and the included supplements provide more insights into Gray's life and creative process. The appeal of a one-man show might not be broad, but this disc is definitely worth a look.